The magic of Christmas becomes even more captivating and jaw-dropping – with the arrival of the internationally acclaimed Circus Vargas troupe, one of the world’s biggest traveling circuses. 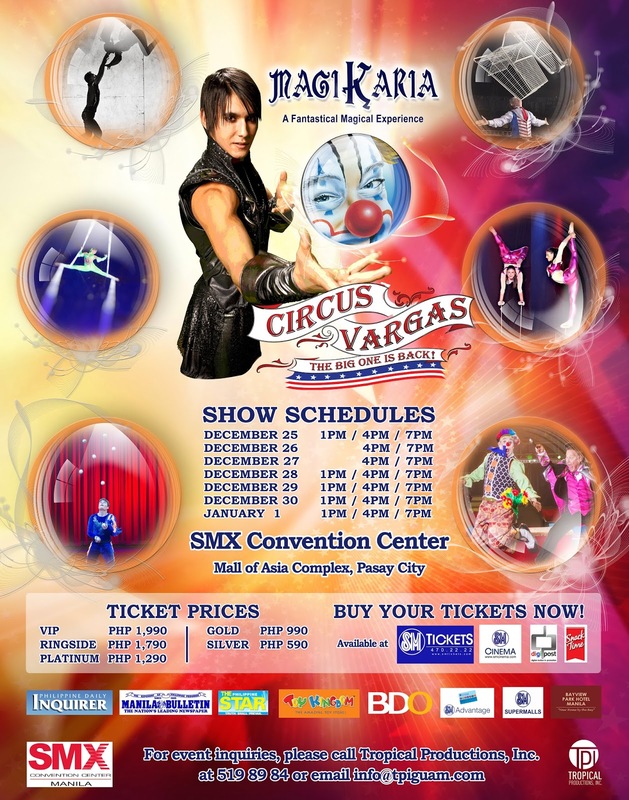 Circus Vargas will be bringing its most exciting production dubbed as “MagiKaria, A Fantastical Magical Experience” in Manila, showcasing gravity-defying flights, flashy costumes, fun dance routines, and other deliriously delightful antics. Said production will feature astonishing athleticism, physical beauty and acrobatic prowess of the men, women and children of the circus. Circus Vargas hopes to deliver the same immense joy and excitement already experienced by millions of people worldwide. Equally mesmerizing is the upbeat juggling styles of Michael Ferreri, a 4th generation performer who started at 13 years old, together with the death-defying cannon jumper Leo Garcia. Then there’s the thrilling trio of motorcycle riders doing their dangerous stunts inside the round metal cage called the Thunder Globe. Charismatic illusionist Patrick Gable will also perform his mystifying illusions that are guaranteed to impress, astound, and make everyone in the whole family a believer of MagiKaria. This extravaganza of magical proportions will be held at the SMX Convention Center, Mall of Asia Complex in Pasay City from December 25 to January 1, 2014. Buy your tickets now at SM Ticket outlets, SM Cinema, and Snack Time outlets.